Coffee Bean processing is converting the raw fruit of the coffee plant into the finished coffee ready for roasting. The method that is used varies and can have a significant effect on the flavor of roasted and brewed coffee. Wet process (also known as Washed): In the wet process, the fruit covering the seeds/beans is removed before they are dried. The wet method requires the use of specific equipment and substantial quantities of water. The coffee cherries are sorted by immersion in water. Bad or unripe fruit will float and the good ripe fruit will sink. The skin of the cherry and some of the pulp is removed by pressing the fruit by machine in water through a screen. The bean will still have a significant amount of the pulp clinging to it that needs to be removed. This is done either by the classic ferment-and-wash method or a newer procedure variously called machine-assisted wet processing, aquapulping or mechanical demucilaging. In the ferment-and-wash method of wet processing, the remainder of the pulp is removed by breaking down the cellulose by fermenting the beans with microbes and then washing them with large amounts of water. Fermentation can be done with extra water or, in “Dry Fermentation”, in the fruit’s own juices only. For most coffees, removal of remainder pulp through fermentation takes between 24 and 36 hours, depending on the temperature, thickness of the remaining pulp layer, and concentration of the enzymes. The end of the fermentation is assessed by feel, as the parchment surrounding the beans loses its slimy texture and acquires a rougher “pebbly” feel. When the fermentation is complete, the coffee is thoroughly washed with clean water in tanks or in special washing machines. 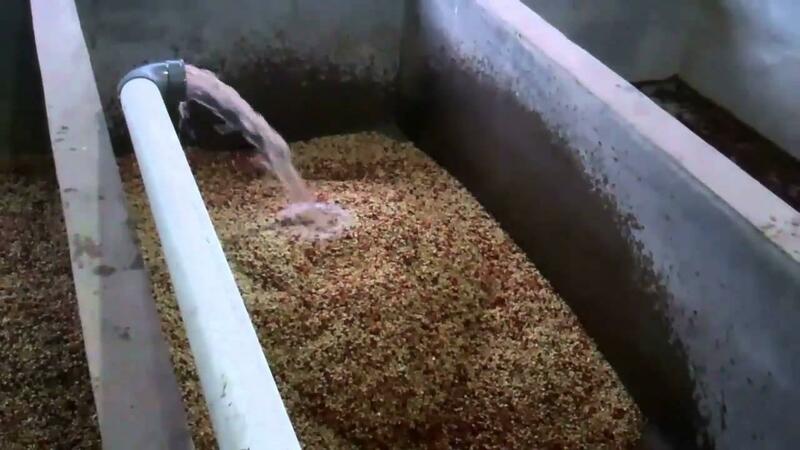 In machine-assisted wet processing, fermentation is not used to separate the bean from the remainder of the pulp; rather, this is done through mechanical scrubbing. However, by eliminating the fermentation step and prematurely separating fruit and bean, mechanical demucilaging can remove an important tool that mill operators have of influencing coffee flavor. After the pulp has been removed what is left is the bean surrounded by two additional layers, the silver skin and the parchment. The beans must be dried to a water content of about 10% before they are stable. Coffee beans can be dried in the sun or by machine but in most cases it is dried in the sun to 12-13% moisture and brought down to 10% by machine. When dried in the sun coffee is most often spread out in rows on large patios where it needs to be raked every six hours to promote even drying and prevent the growth of mildew. Some coffee is dried on large raised tables where the coffee is turned by hand. Drying coffee this way has the advantage of allowing air to circulate better around the beans promoting more even drying but increases cost and labor significantly. After the drying process (in the sun or through machines), the parchment skin or pergamino is thoroughly dry and crumbly, and easily removed in the hulling process. Coffee occasionally is sold and shipped in parchment or en pergamino, but most often a machine called a huller is used to crunch off the parchment skin before the beans are shipped. This process results in a coffee that is cleaner, brighter, and fruitier. Most countries with coffee valued for its perceived acidity, will process their coffee using the wet-process. Dry process (also known as unwashed or natural): Is the oldest method of processing coffee. The entire cherry after harvest is first cleaned and then placed in the sun to dry on tables or in thin layers on patios. The harvested cherries are usually sorted and cleaned, to separate the unripe, overripe and damaged cherries and to remove dirt, soil, twigs and leaves. This can be done by winnowing, which is commonly done by hand, using a large sieve. Any unwanted cherries or other material not winnowed away can be picked out from the top of the sieve. The ripe cherries can also be separated by flotation in washing channels close to the drying areas. The coffee cherries are spread out in the sun, either on large concrete or brick patios or on matting raised to waist height on trestles. As the cherries dry, they are raked or turned by hand to ensure even drying and prevent mildew. It may take up to 4 weeks before the cherries are dried to the optimum moisture content, depending on the weather conditions. The drying operation is the most important stage of the process, since it affects the final quality of the green coffee. 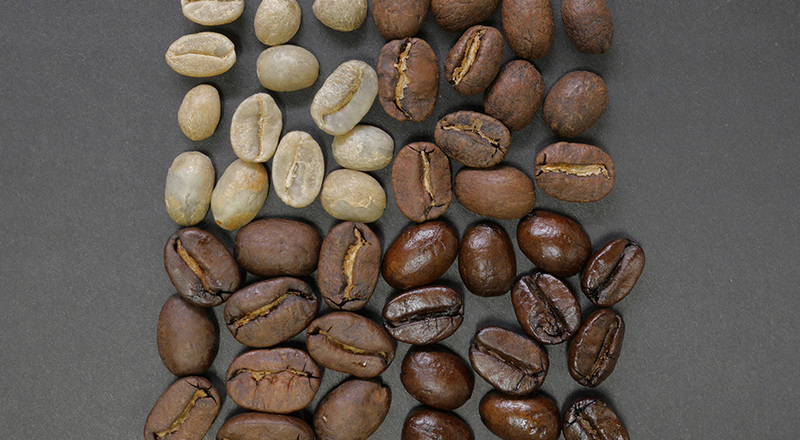 A coffee that has been over dried will become brittle and produce too many broken beans during hulling (broken beans are considered defective beans). Coffee that has not been dried sufficiently will be too moist and prone to rapid deterioration caused by the attack of fungi and bacteria. The dried cherries are stored in bulk in special silos until they are sent to the mill where hulling, sorting, grading and bagging take place. All the outer layers of the dried cherry are removed in one step by the hulling machine. The dry method is used for about 90% of the Arabica coffee produced in Brazil, most of the coffees produced in Ethiopia, Haiti, Indonesia, Yemen and Paraguay, as well as for some arabicas produced in India and Ecuador. Almost all Robustas are processed by this method. It is not practical in very rainy regions, where the humidity of the atmosphere is too high or where it rains frequently during harvesting. This process results in a coffee that is heavy in body, sweet, smooth, and complex. The dry-process is often used in countries where rainfall is scarce and long periods of sunshine are available to dry the coffee properly. Semi-dry process ( also known as Pulped Natural, Honey processing): It bridges the gap between washed and natural coffees as it generally possesses some of the body and sweetness of a natural while retaining some of the acidity of a washed. Honey coffees often have a syrupy body with enhanced sweetness, round acidity and earthy undertones. Semi-Dry Process Is a hybrid process used in Indonesia and Brazil. The process is also called “wet-hulled”, “semi-washed”, “pulped natural” or, in Indonesia, “Giling Basah”. Literally translated from Indonesian, Giling Basah means “wet grinding”. This process is said to reduce acidity and increase body. Most small-scale farmers in Sumatra, Sulawesi, Flores and Papua use the giling basah process. In this process, farmers remove the outer skin from the cherries mechanically, using locally built pulping machines. The coffee beans, still coated with mucilage, are then stored for up to a day. Following this waiting period, the mucilage is washed off and the parchment coffee is partially dried in the sun before sale at 10% to 12% moisture content. The tricky part during the semi-washed process method is bacteria which are always around. Fermentation can start immediately as honey dried coffee beans have a remaining “sugar” layer which is vulnerable to any sort of mold and offers feeding ground for bacteria. 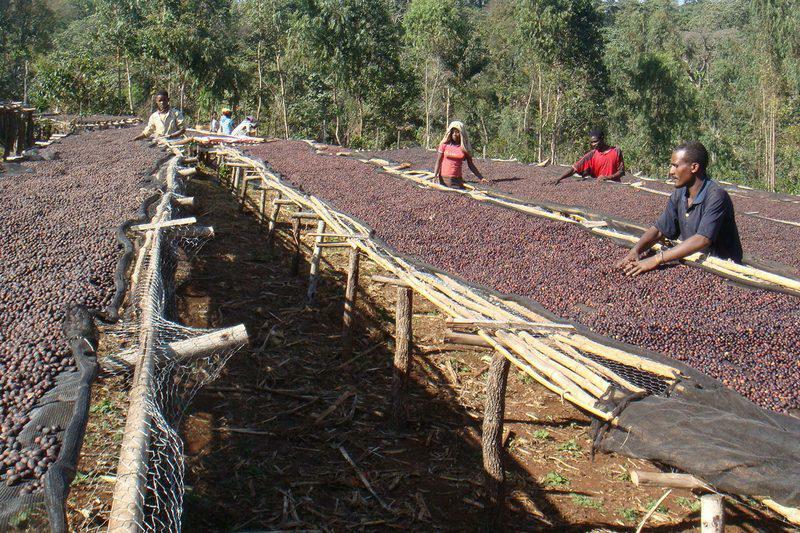 Drying carefully and under supervision is crucial to the success of this processing methods. The beans need to constantly move during the drying process to prevent molt and fungal infections. The processor need to rack the green coffee beans 2-3 times per hour to ensure a safe drying process. Once the beans reached a sufficient moist level, again, the beans are dry milled to remove the “parchment” layers and are sent off the roasters and wholesalers globally. This process results in a coffee that has characteristics of both a dry- and wet-processed coffee. It is often sweeter than wet-processed coffees, has some of the body of a dry-processed coffee, but also retains some of the acidity of a wet-processed coffee. This type of processing can only occur in countries where the humidity is low and the coffee covered in the sweet mucilage can be dried rapidly without fermenting. Decaffeination: In the case of coffee, various methods can be used. The process is performed on unroasted (green) beans and starts with steaming of the beans. They are then rinsed with a solvent that extracts the caffeine while leaving other constituents largely unaffected. The process is repeated from 8 to 12 times until the caffeine content meets the required standard (97% of caffeine removed according to the US standard, or 99.9% caffeine-free by mass per the EU standard). The greatest challenge to the decaffeination process is to try to separate only the caffeine from the coffee beans while leaving the other chemicals such as sucrose, cellulose, proteins, citric acid, tartaric acid, and formic acid at their original concentrations. This is not an easy task considering coffee contains somewhere around 1,000 chemicals that contribute to the taste and aroma. Since caffeine is a polar, water-soluble substance, water is used in all forms of decaffeination. However, water alone is not the best solution for decaffeination because it is not a selective solvent and therefore removes other soluble substances, including sugars and proteins, as well as caffeine. Therefore, most decaffeination processes use a decaffeinating agent such as methylene chloride, activated charcoal, CO2, or ethyl acetate. These agents help speed up the process and minimize the “washed-out” effects that water alone might have on the taste of decaffeinated coffee. 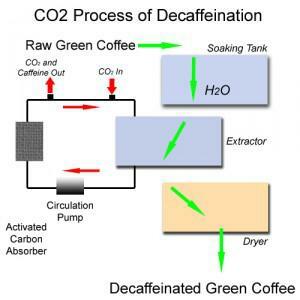 There are two types of decaffeination process, the “natural” extraction and the Solvent extraction. In the natural type, the most common decaffeination process used supercritical carbon dioxide (CO2) extraction. This process has been referred to as CO2 Method, Liquid Carbon Dioxide Method, and Supercritical Carbon Dioxide method but it is technically known as supercritical fluid extraction. The supercritical CO2 acts selectively on the caffeine, releasing the alkaloid and nothing else. Water-soaked coffee beans are placed in an extraction vessel. The extractor is then sealed and supercritical CO2 is forced into the coffee at pressures of 1,000 pounds per square inch (about 69 bar) to extract the caffeine. The CO2 acts as the solvent to dissolve and draw the caffeine from the coffee beans, leaving the larger-molecule flavor components behind. The caffeine-laden CO2 is then transferred to another container called the absorption chamber where the pressure is released and the CO2 returns to its gaseous state and evaporates, leaving the caffeine behind. The caffeine is removed from the CO2 using charcoal filters, and the caffeine free CO2 is pumped back into a pressurized container for reuse on another batch of beans. This process has the advantage that it avoids the use of potentially harmful substances. Because of its cost, this process is primarily used to decaffeinate large quantities of commercial-grade. In this process about 97% of the caffeine is removed from the beans. The Swiss Water Process does not directly or indirectly add chemicals to extract caffeine. Rather, it relies entirely on two concepts – solubility and osmosis – to decaffeinate coffee beans. The Swiss Water Process uses Green Coffee Extract (GCE) for the caffeine extraction mechanism. Green Coffee Extract is a solution containing the water-soluble solids components of green coffee except the caffeine. The process relies on the stability of the soluble components of the GCE and the gradient pressure difference between the GCE (which is caffeine lean) and the green coffee (which is caffeine rich). This gradient pressure causes the caffeine molecules to migrate from the green coffee into the GCE. Because GCE is saturated with the other water-soluble components of green coffee only the caffeine molecule migrates to the GCE; the other water-soluble coffee elements are retained in the Green Coffee. This is what makes the GCE caffeine selective and specific. Once the GCE is rich with caffeine it is then percolated through carbon absorbers which attract the caffeine molecule from the GCE while leaving other green coffee elements intact in the GCE. When the GCE is once again lean of caffeine it is then used to remove additional caffeine from the green coffee. This is a continuous batch process that takes 8-10 hours to meet the final residual decaffeinated target, which is 99.9% caffeine free by mass. The Solvent extraction type, solvents are used in the decaffeination of coffee. Given numerous health scares connected to early efforts in decaffeination using solvents such as benzene, trichloroethylene, and chloroform, the solvents of choice have become dichloromethane and ethyl acetate. Dichloromethane is able to extract the caffeine selectively and has a low boiling point. Although it is mildly toxic and carcinogenic, its use as a decaffeination agent is allowed if the residual solvent is less than 10 parts per million (ppm). Actual coffee industry practice results in residues closer to one part per million. Starting in the 1980s, ethyl acetate was introduced as a replacement to dichloromethane. Although ethyl acetate is mildly toxic, coffee that is decaffeinated with this solvent is sometimes marketed as “naturally decaffeinated” because this solvent may be obtained from a biological process such as the fermentation of sugar cane. Within the Solvent extraction type, two methods are used. The Direct method coffee beans are first steamed for 30 minutes to open their pores and then repeatedly rinsed with either dichloromethane or ethyl acetate for about 10 hours to remove the caffeine. The caffeine-laden solvent is then drained away and the beans steamed to remove residual solvent. The Indirect method coffee beans are first soaked in hot water for several hours, in essence making a strong pot of coffee. Then the beans are removed and either dichloromethane or ethyl acetate is used to extract the caffeine from the water. As in other methods, the caffeine can then be separated from the organic solvent by simple evaporation. The same water is recycled through this two-step process with new batches of beans. An equilibrium is reached after several cycles, wherein the water and the beans have a similar composition except for the caffeine. After this point, the caffeine is the only material removed from the beans, so no coffee strength or other flavorings are lost. Because water is used in the initial phase of this process, indirect method decaffeination is sometimes referred to as “water-processed”.